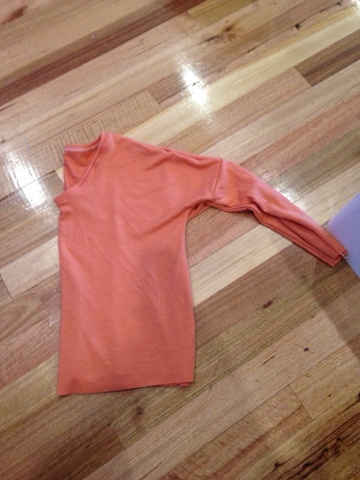 Narrowed the sleeves by 3.5cm - I hate loose sleeves. Of course!! It's a great pattern that would look great in lots of sweater fabrics. The fabric is wonderful, I'm not sure I would look good in orange, yet I wear it anyway, usually with a scarf to put some colour between my face and the top. The fabric doesn't fray so I didn't need to hem it. I will however lengthen the top by 2.5cm and hem it on my next version. Shorten the sleeves by 4cm and hem. I just adjust this while I'm wearing it. Cut a small, it runs large.